The natural beauty of this region provides an idyllic location for romantic anniversary getaways in Midcoast Maine, and our award-winning oceanfront Camden area inn provides the perfect luxurious retreat for your romantic respite and special celebration. Whether you’re looking for adventure or relaxation, we have you covered. Take a vigorous kayak trip across the bay, or an afternoon nap in our seaside hammock. Whatever you need, our staff will ensure your experience is better than you imagined it could be. Plan the details of your getaway on your own, or pick one of our romance specials or packages and let us do the work for you. 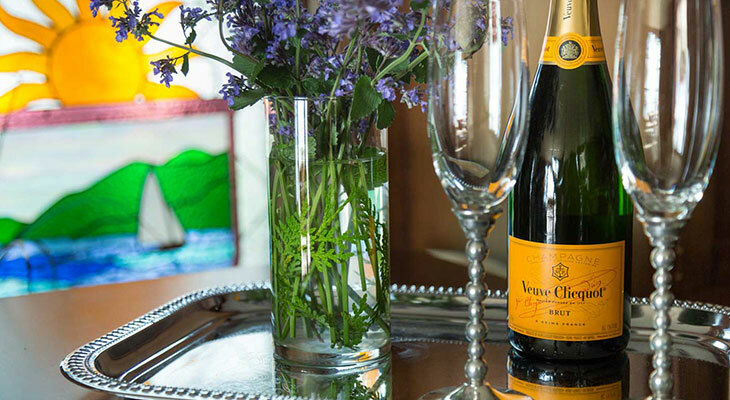 Impress the one you love with our Ultimate Romance package that includes a chilled bottle of Veuve Clicquot Champagne upon arrival, fresh strawberries, fine chocolates, a gorgeous bouquet of red roses, our favorite bubble bath for your room and two 60-minute Swedish massages. Or, make an impression with one of our adventure packages. Our popular Summer Sailing Package includes a two hour schooner sail for two departing from picturesque Camden Harbor, a bottle of red or white wine upon arrival, a beautiful fresh flower arrangement in your room and secret gift from us. Or choose our Wine Lover’s Experience, which includes a VIP tour of Cellardoor Winery for two, a bottle of Cellardoor Wine and a secret gift from us. Or just relax and unwind together with one of our revitalizing spa services – choose from Swedish massage, deep tissue massage and aromatherapy massage. Enjoy the peace and quiet of our romantic rooms with spectacular views, private decks, fireplaces and a wealth of amenities and services. 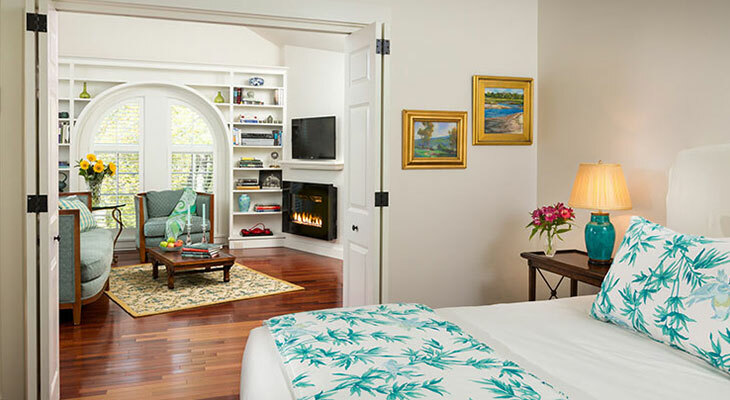 Each room features, exceptionally comfortable furnishings, luxurious down comforters and pillows, fine quality bed linens, plush Turkish towels and plush robes. Watch the sunrise while enjoying a hot cup of coffee roasted right here in Maine, or enjoy a meandering walk on the beach before breakfast. Rise and shine refreshed and ready for a sumptuous, three course breakfast each morning and enjoy the ocean views in the conservatory and dining room. Wake up with Maine roasted Carrabassett coffee, tea, freshly baked scones, muffins, Chef Brad’s popular multigrain bread, or the Inn’s own signature granola and Greek yogurt. Breakfast also includes a fresh fruit course and main course which varies day to day. Guest favorites include poached eggs with prosciutto, roasted asparagus and chive oil, Belgian waffles with warm peach compote and maple glazed bacon, locally smoked salmon and goat cheese omelets and whole wheat pancakes topped with wild Maine blueberries or raspberries. We are happy to accommodate gluten-free and special dietary requests with advance notice. View our photo gallery for a glimpse of all that awaits you when you book your anniversary getaway to remember!